​R.C. 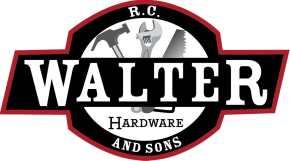 Walter & Sons is a family-owned, neighborhood hardware store located in Boston, PA. We have been in business serving the surrounding Pittsburgh community for over 60 years. In an era of big-box stores, see what a difference convenience and customer service can make on the success of your next project. Check out our online inventory to see if we have what you're looking for before you even get in your car. If you can't find what you're looking for in our online inventory, you can shop from over 45,000 products available at truevalue.com and receive free shipping to our store. *Just be sure to choose the "Ship-To-Store" option when checking out. We pride ourselves in "service first;" encouraging our customers to open packages to see if their choice is the correct one. There is nothing more frustrating then being stuck in the middle of a project, only to find out you bought the wrong part. ​Whether your home was built in the early 1900s or in this millennium, our knowledgeable staff will assist you in to make sure you go home with the right part or product. R.C.Walter & Sons dares you to find any hardware store on the planet that has a higher floor staff to customer ratio. Join our mailing list for news, updates, & great bargains. Voted Best Hardware Store Time and Time Again!